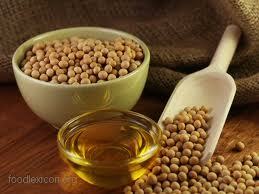 Soybean Oil is the natural oil extracted from whole Soybeans. Typically, about 19% of a Soybean’s weight can be extracted as crude Soybean Oil. The oil content of U.S. Soybeans correlates directly with the temperatures and amount of sunshine during the Soybean pod-filling stages. Edible products produced with Soybean Oil include cooking and salad oils, shortening, and margarine. Soybean Oil is the most widely used cooking oil in the U.S. It accounts for 80% of margarine production and for more than 75% of total U.S. consumer vegetable fat and oil consumption. Soybean Oil is cholesterol-free and high in polyunsaturated fat. Of the edible vegetable oils, Soybean Oil is the worlds largest at about 32%, followed by palm oil and rapeseed oil. Soybean Oil is also used to produce inedible products such as paints, varnish, resins, and plastics. It is also the primary component of bio-diesel fuel, an increasingly important new source of energy. Soybean Oil futures provide a way to effectively manage the price risk that Soybean Oil merchandisers, food processors, importers, and others have related to the purchase or sale of Soybean Oil. Future contracts provide opportunities to evaluate both the current and future supply and demand situation, identify short and long-term cyclical price and volatility patterns. Soybean Oil futures traders are able to take advantage of arbitrage and spread opportunities with other commodities including related grains and oilseeds. The Soybean Oil contract trades at the Chicago Board of Trade (CBOT), part of the CME Group. The electronic futures contract trades on Globex from 7:00 PM CT to 7:45 AM Sunday through Friday. As well as the primary hours of 8:30 AM CT to 1:20 PM Monday through Friday. One Soybean Oil futures contract is 60,000 pounds, or approximately 27 metric tons. The pricing unit is in cents per pound. The previous settlement price (March 13, 2013) for May 2013 Soybean Oil futures was 49.52, or $29,712 per contract. The most common contract symbol is ZL. One futures contract price increment or “tick” is 1/100 of a cent per pound. A one “tick” move is $6.00. The next tick after 49.52 downward is 49.51 followed by 49.50. Therefore, a price move from 49.52 to 48.52 is $600. The performance bond or initial margin requirement to initiate one futures contract position is $1,045 (as of November 11, 2015). To control that futures position going forward the maintenance margin is $950 (as of November 11, 2015). The Daily Price limit is $0.02 cents per pound, expandable to $0.03, when the market closes at limit bid or limit offer. For example, if the market closes at limit offer, or 47.52, on Thursday, March 14, 2013, the next session’s Daily Price Limit would increase to $0.03. If the following trading session fails to close at the limit, the next session’s Daily Price Limit reverts to the $0.02 cap. The exchange resets daily limits for Soybean Oil in May and November of each year, based on a percentage of the average settlement price of benchmark contracts during a roughly nine-week observation period. The futures contract month listings are January (F), March (H), May (K), July (N), August (Q), September (U), October (V), and December (Z). The same contract month listings as the Soybean Meal futures contract. The futures contract’s Last Trading Day (LTD) is the business day prior to the 15th calendar day of the contract month. The May 2013 Soybean Meal futures contract LTD is May 14, 2013 for example. The First Notice Day (FND) for that same contract is April 30, 2013. Significant fundamental reports to be aware of are the United States Department of Agriculture (USDA) Crop Progress reports, typically released at 3:00 PM CT on Monday’s, and the periodic Crop Production and USDA Supply/Demand reports, typically released at 11:00 AM CT.
Visit https://www.danielstrading.com/ for additional contract specifications and market information regarding the Soybean Oil futures market.